Struggling with complex Rails app and business domain? How do I break it down into smaller, more manageable units? How do I decouple this and that? How do I connect together those uncoupled parts? How do I keep it from collapsing down? But we also understand that we must use tools and techniques which can be easily introduced into new and legacy Rails apps. For a few years we’ve been studying Domain-Driven Design and applying its techniques in our projects. In Domain-Driven Rails we describe 11 techniques that you can use separately and together in new and old Rails apps to achieve better architecture. They were useful to us and we are sure they are going to be useful for you and your complex apps. These techniques have been used for a long time in Java and .NET communities in complex, enterprise projects. But reading about them does not make it easy to figure out how to apply them in the context of Rails apps. That’s where our book comes in with help. Same techniques but explained using our language (literally and metaphorically). 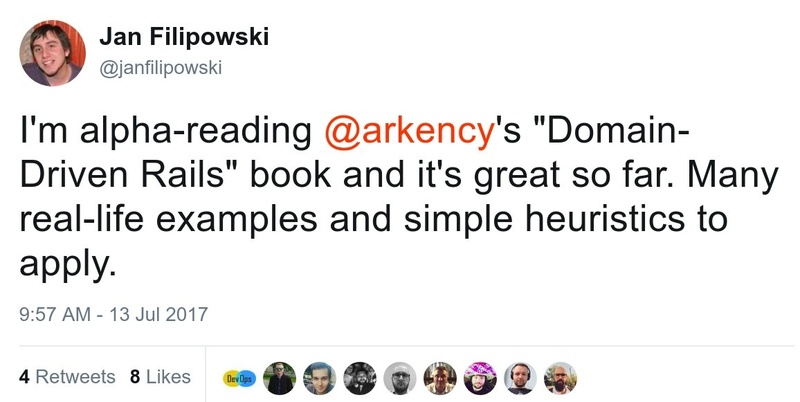 Thanks @arkency for Domain-Driven Rails book. Long time haven’t seen a book to read without stops for several days. 7 online videos, 3 hours 50 minutes in total.